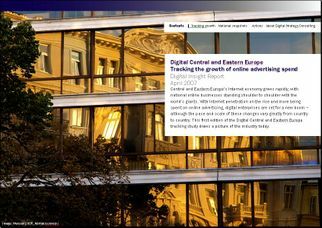 Please feel free to comment on the contents of this report and the future of the internet industry in Central and Eastern Europe. We are looking forward to hearing from you! We will see the CEE region grow rapidly in the next years. It will be partially due to the fact that the Internet will become more and more accessible in many countries. The pace of changes, however, very much depends on the local, governmental initiatives which aim to improve the infrastructure and accessibility. They are also important to speed up the process of liberating the telecommunication markets and making the Internet prices go down. Some of the countries in the CEE region which joined EU in last few years have already made a lot to improve the Internet accessibility. Estonia and Slovenia is a good example. The Internet penetration there is already as high or even higher than in Western European countries. It will be mainly Hungary, Czech Republic and Slovakia which will face a significant increase in the Internet users (the main factor being the low connection prices if we compare them with other Central and Eastern European countries). Russia is another emerging market. The main constraint there is, however, the fact that the majority of Russian society does not have computers. There is an enormous technological gap between the places like Moscow or St Petersburg and the provinces. The penetration in those two big metropolises is round 50%, which is very high. It has to be said that the Russian government makes a lot of effort to make computers and telecommunication services more widely available. The biggest growth in online adspend will be seen in those countries which so far had relatively low online advertising prices and now due to the strong increase in demand will be changing their price lists (e.g. Latvia and Ukraine). Many advertisers have just recently discovered the Internet as a powerful marketing medium so due to this fact we can expect further growth in online adspend across CEE region. In any country in which a big Western online player starts operating, the competition between the firms will stimulate the spendings. When Bite – a telecommunication giant – appeared in Latvia in 2006 local telecoms started spending much more on the online advertising. We can expect that this scenario will repeat in other Baltic states, Ukraine and Croatia. Ukraine is undoubtedly a country which experiences a boom in investments. Romania and Bulgaria may follow suit.The rate of growth in online adspend in the CEE region can be estimated between 30-50% for next ew years. Baltic states, Ukraine, Russia and perhaps also Romania and Bulgaria will face experience the biggest growth. Internet market size may double there in 2007. In my view the most developed part of the CEE markets is Czech Republic followed by Poland and Hungary. Online advertising spending is the highest in those three countries, however, we can now see that the gap between these places and the rest of the CEE region is closing. Hence, the smaller markets are becoming more attractive for foreign investments or joint venture capital. In terms of numbers Polish market is the biggest in the CEE. There is the biggest number of Internet users. Therefore this country is a crucial market for all companies which would like to dominatein the region. The Czech market seems to be the most developed and most technologically advanced but this factor may make it the most difficult to enter. One domestic search engine still dominates the Czech landscape. The Hungarian market is very competitive and therefore also not easy to enter. Etarget operates in Czech, Slovak, Hungarian and Romanian market. Their expansion plans include Poland and other countries. Ukraine is an attractive market with 50% online aspend growth year to year. The nominal value is still small but it is definitely a place worth investing. A key factor is to find a reliable partner to start businesses with. Russian influence in strong in Ukraine but there is room for Western companies on the market too. One of the main drivers of Hungarian market is the growth of Internet penetration and the changes in media consumption: TV and newspapers' audiences are decreasing whereas Internet users are on the up. The Internet has recently become a "must use media". Web 2.0 and search has made a huge impact on the industry. We believe that online aspend growth will be strong (20-35% per year) for next 2-3 years but less rapid than in previous years (40-60%). The entire media adspend increased about 13% in 2006 in Croatia while the growth of online adspend was estimated for round 30%. Bearing in mind that only a small part of media adspend goes to the Internet 30% still does not make a great change. If online adspend took 0.45% of all advertising budgets in 2005, then in 2006 it rose up to 0.6%. The growth was mainly caused by the increase of broadband users and the adoption of the Internet in media mix. In 2007 online adspend should take 1.1% of all media advertising. Users' power over the Internet businesses will increase. It is the users who will decide on the directions which the firms should follow and on what projects they should focus on. No doubts that chief executives will have to take users' opinions into considerations every time they plan any moves. In 2006 there was a significant growth of search engine marketing which led to a quiet revolution in media mix structure where more and more ad spend was allocated to search. Danny has been an international commentator on the digital networked industries since the mid nineties and is recognized as being a leading authority on digital marketing. He managed the UK's first online newspaper (telegraph.co.uk) where he stewarded it to win Newspaper of the Year repeatedly. He has helped run web businesses ranging from mass market portals and consumer magazines, to online stores and search and email services. He has been recognized by the DTI as being one of the 100 founders of the UK internet industry, and acknowledged by trade magazines for many years as being one of the most influential figures in his industry. He is the co-founder and former chairman of the UK and European Internet and Interactive Advertising Bureau trade associations, and has helped launch twenty further digital trade associations and initiatives around the world. He has acted as a government advisor in the DTI and Home Office, and retains roles on advisory boards for digital investment funds and digital firms. He has been lecturing on digital marketing and publishing for more than a decade and was recently awarded fellowships of the Institute of Direct Marketing, and the Royal Society of Arts. He set up Digital Strategy Consulting in 2000 to help firms make sense of the rapid changes brought about by the digital world, and show them how to harness the potential of the digital networked economy. He is an enthusiastic educationalist and continues to teach university Masters courses and management courses. Istog trena možete ubrzati performanse svojeg tima, te pomoći svojoj organizaciji u bržem rastu i povećati stopu zadržavanja suradnika/osoblja. Mi pomažemo izgraditi njihovo znanje i vještine u digitalnim medijima i marketingu, mijenjanjem njihovog stava i postavljanjem zajedničkih ciljeva prema ključnim osobama. Naši otvoreni tečajevi upliću vašu strategiju, te tako osiguravaju trening koji ima trenutni utjecaj i dugoročne efekte. We are delighted to run a Digital Serach Marketing Training in Warsaw , Poland on 22nd June 2007. Specjalna oferta dla polskich przedsiębiorstw i osób prywatnych: kursy marketingu internetowego prowadzone przez brytyjskich ekspertów Digital Training Academy we współpracy ze stowarzyszeniem branżowym IAB Polska zakończone międzynarodowym certyfikatem. Chcesz wzbogacić bądź uzupełnić swoją wiedzę albo podszkolić swój zespół? Chcesz zwiększyć swoje przychody z internetu? Nie zwlekaj, zapisz się na kurs! Masz do wyboru 5 różnych szkoleń. Insight Reports to bring you insights from a particular part of this fast changing industry. They are independent perspectives on key issues in doing business or marketing in the digital networked economy, and are published monthly. Keeping on top of the latest research and trends is still a challenge for many, but Digital Intelligence can help you. To keep our Digital Training Academy classes up to date we trawl through hundreds of websites, magazines and research newswires every month and distil some of the key points into this review of the industry's growth and the evolution of marketing.